This opening should serve as hindsight to Amy Horowitz’s book about the musiqa mizrahit. 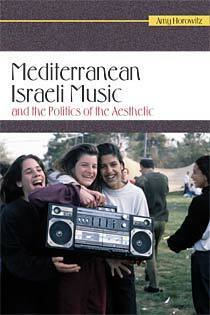 Given its inclusive title, one would expect this book to be a scholarly study of the process that took musica mizrahit from its beginnings in the Tel Aviv neighborhoods of Kerem ha-Teymanim and Ha-Tikva in the 1970s, through the controversies surrounding its artistic and cultural value in the 1980s, to the gradual shift of its status in the 1990s, up to its thriving success in the new century. This book’s undertaking however is quite modest: it depicts the voices and meanings of musiqa mizrahit in the years of its ascendance to becoming a prominent, not yet legitimate force in Israeli popular music – the 1980s and early 1990s. Limiting herself to this period, Amy Horowitz’s book reads like a postcard from the past. Based on her extensive ethnographic work, and written for the most part in the present tense, the book seems to be combating an already won battle. The underlying argument threading throughout the book targets prevailing notions about Mediterranean Music when it was still marginal and unwelcomed on the radio. Against dominant cultural forces that perceived musiqa mizrahit as a single, relatively monolithic musical idiom, the book argues that it is multivocal, consisting of a rich and diverse spectrum of styles. Against the downgrading of Israeli Mediterranean music and its exclusion from the media, on the grounds that it does not meet the standards of modern popular music, Horowitz’s analysis exposes the contemporariness of the music: its modernity. By 2010, however, the stylistic diversity of musiqa mizrahit is hardly disputed by anyone in the field, and its presence in all media channels in Israel is anything but excluded or marginalized. The changes in the field, in other words, render Horowitz’s argument obsolete. Medina’s perceptions seem to have had a strong impact on Horowitz’s own views and interpretations. This becomes apparent in her reading of Zehava Ben’s (early) career in chapter 6. The chapter revolves around Ben’s reclaiming of her Arab-Moroccan roots as a legitimate component of her Israeliness, best exemplified in her recording of Umm Kulthum’s “Enta Omry” and other Arab songs: “With these Arab CDs and live performances of Arab songs, Ben defied single-voiced categorizations and claimed conflictual identities and multiple indigeneities” (144). For all its efforts to avoid romanticism and glorification, the book in the end offers a slightly overstated optimistic reading of Israeli Mediterranean music. Emphasizing the supposed counter-hegemonic aspects of the genre, and pointing to its hidden promise at being a bridge between Arabs and Jews, the book hardly discusses the nationalism of the lyrics, and the conservative, pleasing nature of its aesthetics. Motti Regev and Edwin Seroussi, Popular Music and National Culture in Israel. (Berkeley: University of California Press, 2004), 235.